Principal Cast : Elsie Fisher, Josh Hamilton, Emily Robinson, Catherine Oliviere, Jake Ryan, Luke Prael, Daniel Zohlgadri. Synopsis: An introverted teenage girl tries to survive the last week of her disastrous eighth grade year before leaving to start high school. Painfully raw, Bo Burnham’s Eighth Grade is a pins-and-needled story of adolescence and the yearning for acceptance, told through the eyes of Elsie Fisher’s young Kayla Day, a girl struggling to deal with her lack of popularity at school, physical and emotional insecurity, and the impending levelling-up of moving from middle school to high school (the US education system works differently to that here in Australia). I know it works as a film because my wife sat through it and described it simply at the end as “spot on”, indicating the simmering angst and confused sense of self rings true for young girls everywhere. I take my cues for my review from my wife only because I’m not, nor have I ever been, a fourteen year-old girl, desperate for the attention of the school’s “hot guy” or her peers; Eighth Grade’s social cringe is exacerbated by the very echoes of this behaviour I’ve seen in my own children. Kayla Day (Fisher, who voiced the unicorn-loving Agnes in the Despicable Me movies) lives with her single father (Josh Hamilton – Manchester By The Sea) and is finishing Eighth grade at school, a transition period she is wary of and somewhat frightened about. Kayla struggles with her own sense of self, vlogging self-help videos on YouTube but failing to live up to her own advice. Painfully shy, Kayla attempts to befriend the popular girl at school (Catherine Oliviere) without success, and is attracted to hunky classmate Aiden (Luke Prael), also without success. Whilst on an inter-school transition trip, Kayla meets the outgoing Olvia (Emily Robinson), who takes the young girl under her wing, whilst Kayla’s father tries clumsily to get to know his daughter with limited understanding. When I was a pre-pubescent kid at school, the book of our generation that hit the notes similar to Eighth Grade was “The Secret Diary of Adrian Mole”, a coming-of-age “diary” about a boy dealing with the exact same issues described in Bo Burnham’s film. Puberty, sexuality, fitting in, social ostracisation, maturity; all elements of a hormonal teenager trying to find (her) way in the world. Eighth Grade is painfully truthful with this material, unflinching in its gaze upon our social-media addicted youth and the corrupting influence this technology has on them as a whole. Kayla’s video entries ring painfully true of my own experience: my own daughter, who is nine-going-nineteen as of this review, loves to video herself and pretend to be a YouTube influencer (don’t worry, she can’t upload anything, thank goodness), and I see a lot of her fumbling understandings in this film’s exploration of similar stuff. Burnham, who wrote the screenplay as well as directing, brings a precise focus on the awkward nature of this age, with the affluent and socially experienced “mean girls” posse touching a nerve with anyone who ever encountered such a collective, while the nervous “first date” between Kayla and one of her friends’ cousins (played by a terrific Jake Ryan) is beautifully cringe-worthy for its accuracy in young human interaction. The idealised world of social media, where people interact through their phones via Instagram and Snapchat (not Facebook, according to this movie!) is perceptively alarming, our ability to connect with virtually everyone at any time opening an enormous bucket of worms for parents who see this occurring in their own children. 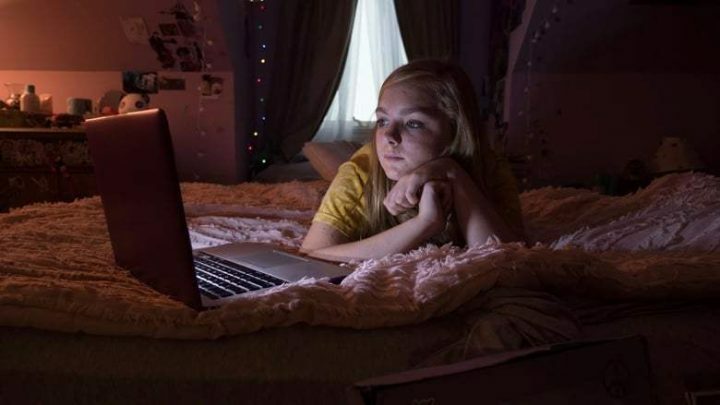 The ubiquity of social media in our lives isn’t going to go away, either, and Eighth Grade’s terrifying glimpse into how vicious things can be here will open many eyes, I’d warrant. At a performance level, the honesty and bravery of young Elsie Fisher in this movie is gut-wrenching. Burnham avoided making the young actress “movie ready” in any way, so Fisher appears on screen with acne and other pubescent flaws in their entirety, bringing a truth to both the character and the movie overall that’s heartbreaking. Fisher’s stumbling, stammering speech patterns and hunched, insular physicality throughout are immediately recognisable from any number of kids walking through the mall or through school corridors; too often, actors are described as “brave” for taking on uncomfortable roles but the honesty and integrity of Fisher in delivering as truthful a character as she does here is the very personification of the word. A key sequence in which Kayla is placed into a sexually uncomfortable situation at the hands of one of Olivia’s school friends will have you absolutely squirming in your seat, it’s so realistic and jarring, and both Fisher and the actor playing opposite her, Daniel Zohlgadri, do superbly honest work here. I can appreciate Eighth Grade’s on-point depiction of teenage insecurity because at one point I was an insecure teenage boy going through a lot of similar things that Kayla Day does here. I can also appreciate that as a guy, I don’t fully understand these issues from the female perspective, but if my wife’s reaction is anything to go by then Bo Burnham has truly hit a home run with this story and the characters in it. The film feels like a companion piece to Call Me By Your Name or The Perks Of Being A Wallflower in many ways, a film about the uncomfortable truth of teenagers and the modern pressures they face to fit in, be themselves but also conform to expectations placed unrealistically on their shoulders. As a coming-of-age film there’s few as raw and pointedly honest as this, a film that should make compelling viewing for kids of this age group and their parents. Tackling uncomfortable themes and delivering as brutally honest a film I’ve seen this year, Eighth Grade is essential viewing for anyone who has ever lived through this age range.